We have many ways to measure how well public officials in all countries are behaving. Each year, various organizations provide country rankings as to how well countries are doing in maintaining economic freedom, restraining corruption, protecting civil liberties, including religious freedom, etc. 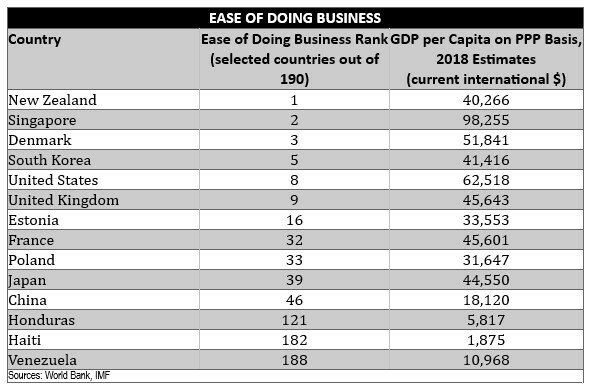 One of the measures is the annual report by the World Bank on Doing Business. The 2019 report ranking 190 countries has just been released. The report investigates “the regulations that enhance business activity and those that constrain it,” including property rights and labor policies. In addition to the rankings, the report contains case studies of places and areas of regulation where significant reforms and improvements have been made. The enclosed table takes a ranking sample from some of the best and worst countries. The annual reports and rankings of economic and civil society success provide roadmaps for leaders in poorer countries who may wish to see their own citizens prosper. The question is, why do so few of them actually undertake the obvious reforms necessary? Even if some leaders care little about their own citizens, one would expect their own egos to drive them to make major constructive changes. Few remember the hundreds of leaders who merely served as placeholders, or worse, rather than being change agents. Lee Kuan Yew will always be remembered as the man who took Singapore from being a poor Asian backwater to one of the most successful and prosperous places on Earth, now having a higher per capita income than the United States. When asked to name former British prime ministers, Margaret Thatcher is almost certain to be the most recalled — because she took a nearly bankrupt and despondent country and made Britain great and prosperous again. Ronald Reagan is by far and away America’s most beloved former recent president, because he both revitalized the American economy and its spirit. In contrast, look at Haiti and Honduras. Despite each being independent for two centuries, they have been unable to produce the political leadership to move the countries away from grinding poverty and corruption. A comment was made to me recently that, without remittances (the payments made by citizens of a country who are working abroad and sending money back home), Haiti would have a negative GDP. (I have not looked at the data closely enough to know if that is literally true — but it is probably not far off the mark.) Many Haitians and Hondurans come to the United States and work very hard, and are worth whatever they are paid, or more, to their U.S. employers. Why is it that the same person is worth 10 times as much per hour in the United States than in their home country? Leaders of poor countries often find it much easier to engage in corrupt bargains with the ruling elite to, in essence, steal some of the country’s wealth rather than engage in the hard work of economic reform. An honest leader in a poor country is probably not particularly well paid, while a dishonest leader can accumulate many millions. Some religious organizations, like the Amish, use shunning to discipline those who have engaged in bad behavior. Too many in the global political, media and business class fawn over even the most corrupt. It might be useful if the upright did more to encourage other notables to shun the bad actors. Much more should be done to honor and reward those who brought real reform and greater prosperity and liberty to their own people. This could be done by one or a group of billionaires setting up a prize system like the Nobel prizes, to give a prize with a substantial monetary reward (e.g. $10 million) to a select few each year who have done the most to bring about successful economic reform in their own countries. Too few know who Mart Laar and Leszek Balcerowicz are. Mr. Laar became the youngest prime minister in Europe in 1992 and led the radical economic reform in Estonia — which had just received its independence from the Soviet Union. His reforms resulted in Estonia becoming a normal middle-income European country within one generation, and his creation and promotion of “e-government” to get rid of corruption is now being adopted by many other countries. Mr. Balcerowicz served as deputy prime minister, finance minister, and president of the National Bank of Poland during the years from 1989 to 2007. More than any other single individual, he is responsible for Poland becoming a high-growth and normal middle-income European country. If people like Mr. Laar and Mr. Balcerowicz were given the international recognition they deserve, along with a tangible award, perhaps others who become leaders of poor countries will be inspired and more motivated to undertake the necessary reforms.